How much do we love books? Let us count the ways—till Christmas and beyond. Starting today, your favorite quote about the beauty and value of the book could win you this beautiful letterpress keepsake, as well as a chance at a free copy of the gorgeous hardback edition of Gutenberg’s Apprentice. 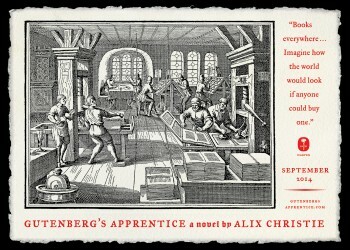 The keepsake was printed on a Vandercook proofing press in Santa Cruz, California, at the Foolscap Press. It features a woodblock print by the prolific 16th century German artist Jost Amman, showing a view of a contemporary printing house. The birth of the printed book took place in just such a workshop, though probably not one with such lovely light streaming through arched and leaded windows! 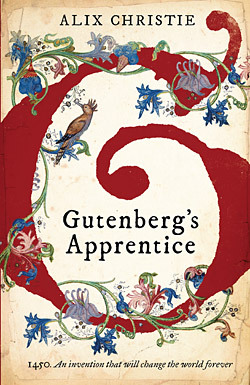 “This gorgeously written debut, set in the cathedral city of fifteenth-century Mainz, dramatizes the creation of the Gutenberg Bible in a story that devotees of book history and authentic historical fiction will relish." 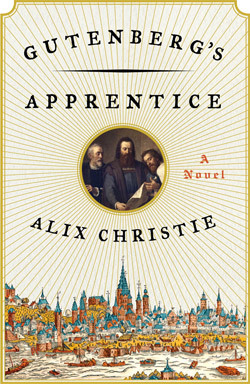 “A sophisticated, moving story of the creation of the Gutenberg Bible"
“Alix Christie’s finely atmospheric debut novel…[is] a worthy tribute to the technological revolution it reimagines, as well as a haunting elegy to the culture of print." “A richly imagined, emotionally powerful, spectacularly convincing account of one of the most important events in Western history."